Just recently Lisa gave a private AGA class in a beautiful Dorset farmhouse close to Sturminster Newton. As well as teaching the lovely Jules how to prepare partridge from her shoot, they spent a cosy afternoon preparing a rich fruit cake so that it could bake slowly in the simmering oven. Now Jules is religiously feeding her festive treat with her favourite tipple ready for the winter holidays. 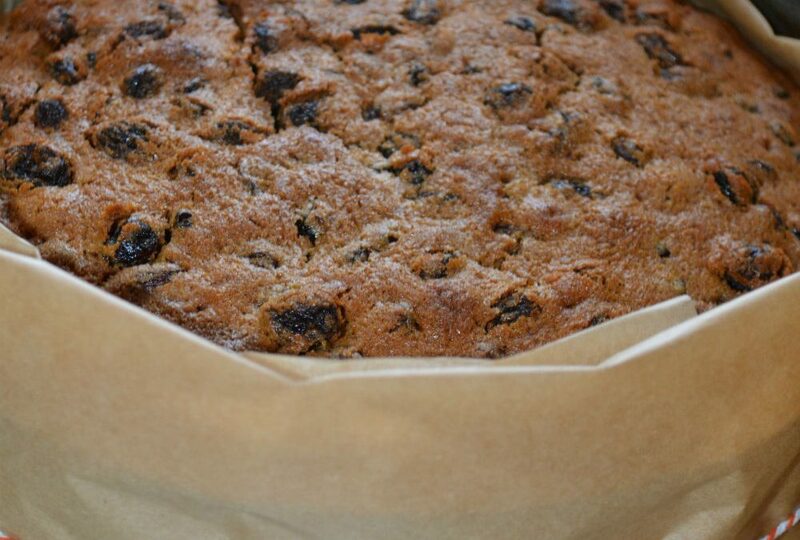 20 cm (8 inch round) cake tin greased and double lined with parchment. Wash and dry the dried fruit and place in a bowl with the orange zest, juice and brandy. Cover and leave to soak overnight. Sift the flour and spices together. Gradually add the eggs with a tablespoon of flour and mix well. Fold in half the flour and then add the soaked fruit, cherries and peel. Continue to mix carefully with the remaining flour. Ensure that the mixture is evenly distributed and that there is no dry flour or fruit left. Bake in a conventional oven for approximately 31/2 – 4 hours. Bake for 6-61/2 hours or until cooked through when tested with a skewer. Cook the cake in baking oven at slumber setting. Once your cake is done, leave in the tin but place on a cooling rack until it is completely cold. Then remove all of the baking parchment and store in an airtight tin. Remember to ‘feed’ it regularly with your favourite tipple. We like to decorate our Christmas cake with toasted marzipan and we will share this recipe in December.